On 20 November 1915, Sherriff left his insurance job to enlist in the Artists Rifles, which was essentially an Officer Training Corps. His training took place at Hare Hall, Gidea Park, near Romford in Essex, and on 5 September 1916, Sherriff was commissioned as a Second Lieutenant and was sent to the 3rd Battalion of the East Surrey Regiment at Grand Shaft Barracks in Dover. 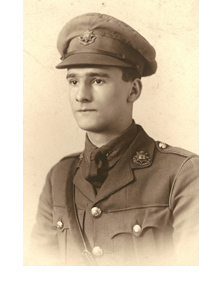 On 28 September he arrived in France to join the 9th Battalion of the East Surrey’s, and was ready to move to the front only a few days later, in early October. During November and December, he learned about tunnelling with the Royal Engineers: this was something he enjoyed, and he later applied, without success, for a transfer. His own regiment gave him the job of training men to build dugouts. In January 1917 he was having problems with neuralgia around his eye. He thought it might be something to do with his teeth, and on 26 January he was sent to an officer’s rest station behind the lines, where a dentist could examine him. He experienced so much anxiety, that on 1 February he wondered whether he should resign his commission rather than go back to the front. He didn’t resign, however, and he returned to the trenches. In April he was troubled again by neuralgia, and was given some time off; he had leave back home in England in the summer. He returned to France on 4 July, and at the end of that month his regiment took part in the Third Battle of Ypres (Passchendaele). On 2 August he was wounded on the right hand and the right side of his face. It was not too serious; however, he was sent back to England and recuperated in a hospital in Netley, Hampshire. In September, his neuralgia returned, and he went to St Thomas’s Hospital in London. While waiting to be fit for service overseas he spent some months in Dover training new recruits. In March 1918 he was promoted to full lieutenant. In the summer he was ill again, and did not return to France. He was promoted to Captain in January 1919, and was demobbed soon after that. I am relying on the account by W. Lawrance in the online Great War Literature Magazine.